There are few surviving populations in West Africa. This one needs protection. 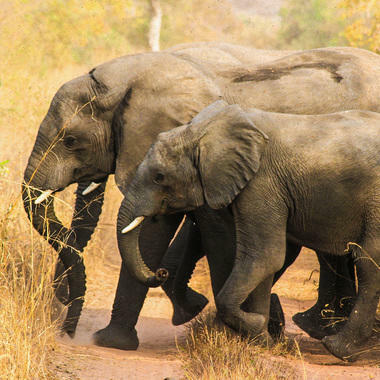 Yankari Game Reserve occupies 866 square miles in a volatile region of Nigeria, home to buffaloes, hippos, lions, and, at 100-200 animals, one of the only elephant populations left in this huge country. Among the threats to the elephants, in addition to poaching, is conflict with farmers in the villages surrounding the park. Elephants raid the farmers' crops and the farmers retaliate. WCS co-manages this reserve with the state government. As part of our protection efforts, we launched the Elephant Guardian Program in six of the most vulnerable villages around Yankari. In collaboration with village heads and chiefs, our WCS team trained 12 people from these towns on safe and effective means of chasing elephants from farms and how to act as a first line of defense. We also armed them with solar-powered lanterns, monthly phone credits for communicating with the WCS office, and modest monthly allowances. So far, it's been a tremendous success. There was once a perception in the communities around Yankari of government inaction on crop raiding. 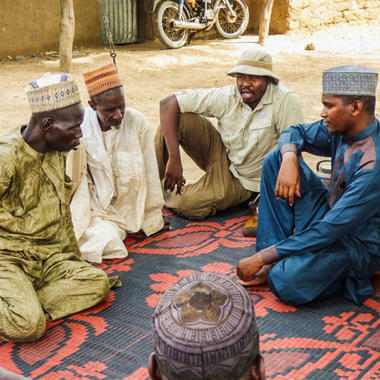 Through this program, the Yankari team, including WCS’s Nachamada Geoffrey (second from right), holds monthly meetings with the Elephant Guardians to discuss issues. A local farmer shows the bee keeping effort he just started. In some places elephants are afraid of bees, so this is an alternative way to keep the animals from coming onto farms. WCS's Geoffrey is exploring ways to further support the practice. 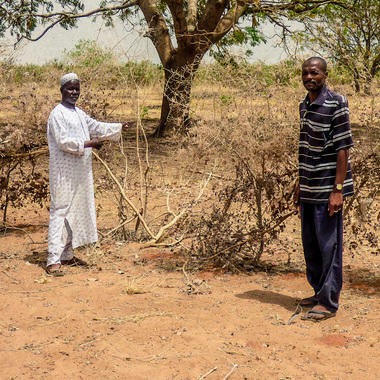 Elephant Guardian Danladi Umar (right), a local farmer, convinced the royal council in his village, Yelwan Duguri, to support the program and elephant conservation more generally. He also met with the youths of his village to get them on board. 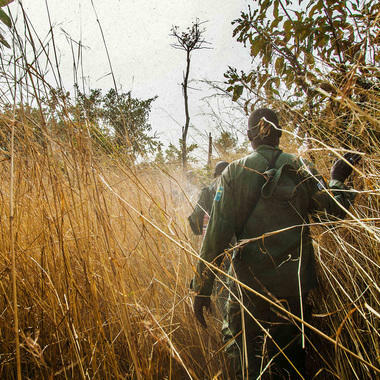 Guardians have been warning the Yankari team (pictured) of poachers entering the reserve. Between May and December 2016, they reported 20 separate cases that, all told, resulted in the arrests of seven poachers. 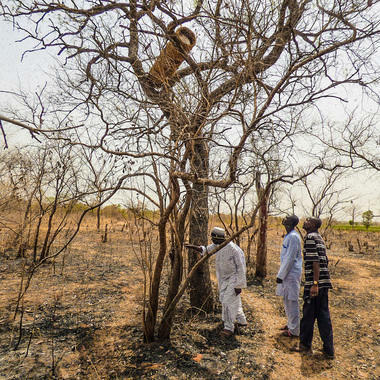 The Elephant Guardian Program has contributed to the recent decline in elephant hunting in Yankari. The last possible poaching incident was recorded in February 2015. Yankari is a remote reserve in an unstable region. 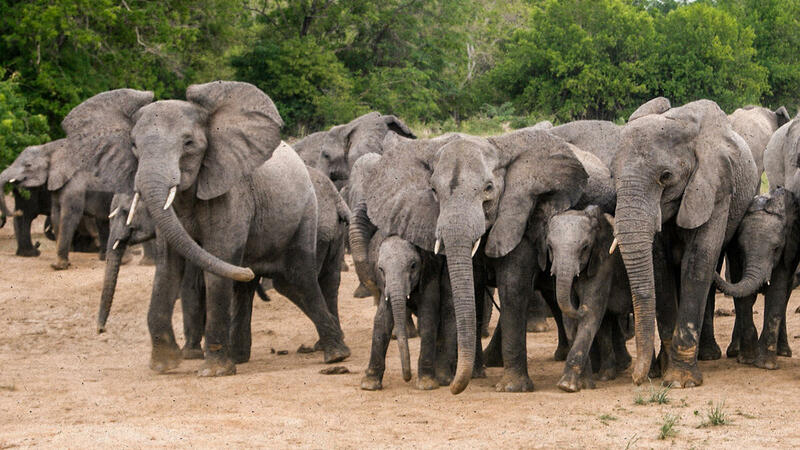 Its champions need our support to protect an important population of elephants. Donate today and help them hold the line.